Globally tracked equity index provider MSCI has announced plans to include China ‘A’ shares in the MSCI Emerging Markets Index in phases from May 2018 to August 2018. Analysts see some degree of foreign fund outflows from other emerging markets, including India, as 222 large-cap Chinese companies will be added to the MSCI Emer-ging Markets Index, diluting the weight of other emerging markets in the index. The MSCI announcement also signalled the further opening up and liberalisation of mainland China’s financial markets to foreign portfolio investors (FPIs). MSCI— once known as Morgan Stanley Capital Interna-tional before being spun off—said the decision has broad support from international institutional investors it consulted, mainly on the improved accessibility of A-shares and the loosening of pre-approval requirements over index-linked investment vehicles globally by Shanghai and Shenzhen stock exchanges. Reports from big broking firms indicated limited impact on the Indian market from the addition of China A-shares to the Emerging Markets Index. The reports put related outflows from the Indian market at just about $200 million. Still this event, in the making for the past three years, is important for the Indian equity market as FPIs are going to realign their emerging market (EM) portfolios to buy China A shares by selling a part of their other emerging market holdings. India and South Korea would be impacted significantly as after China, the two countries have significant weightage in the index. South Korea has a weightage of about 14.2 per cent and India, 9 per cent. China A-shares are shares of mainland China-based companies and were historically only available for purchase by mainland citizens since foreign investment was restricted. Since 2003, select foreign institutions are allowed to purchase them through a qualified foreign institutional investor (QFII) system. China A-shares are listed and traded on the the Shanghai Stock Exchange and the Shenzhen Stock Exchange. The MSCI EM Index has representation from 24 countries, with China, South Korea, Taiwan, India, Brazil and Russia having a larger weightage in the index. China has a weightage of 27.66 per cent on the index, although that includes only Hong Kong- and US-listed shares of Chinese companies. Though China is the world’s second largest equity market, with a market capitalisation of roughly $6.9 trillion compared to $27 trillion for the US and $5.6 trillion for Japan, China A-shares were not represented in major global indices. The gradual addition of mainland China A-shares will align global index composition to better reflect the size and importance of the China’s mainland economy to global markets. Overseas investors will gain automatic access to A-shares by investing in products that track the MSCI EM Index, says Singa-pore’s DBS Bank. Analysts feel the A-shares’ inclusion is a major step forward for Beijing as it attempts to liberalise its financial markets and internationalise the yuan. Addition of China A-shares could be a big boost to China’s stock market, which has until now drawn limited foreign investor interest because of high volatility, frequent trading halts and limited foreign investor access to the Shanghai and Shenzhen markets. The MSCI EM Index captures large and mid-cap representation from across EMs. With 830 constituent companies, the index covers about 85 per cent of the free float-adjusted market capitalisation in each of the 24 countries. There are 76 large and mid-cap Indian companies in the MSCI EM Index. The top ten Indian companies by weight in the index are Housing Development Finance Corporation, Infosys, Relia­nce Indus-tries, Tata Consultancy Services, ITC, Axis Bank, Maruti Suzuki, Tata Motors, Hindustan Uni-lever and Larsen & Toubro. Some other top names in the MSCI India list are ICICI Bank, Mahindra & Mahindra, Sun Pharma­ceuticals, State Bank of India, Yes Bank, HCL Technologies, Bharti Airtel, Eicher Motors, Ultr­a­tech Cement, Indiabulls Housing Finance and Vednata. Even today the MSCI EM Index is dominated by Chinese companies with six of the top 10 constituents coming from China—Tencent Holding (4.24 per cent), Alibaba Group (2.99 per cent), China Construction Bank (1.51 per cent), China Mobile (1.48 per cent), Baidu (1.10 per cent) and ICBC (1.07 per cent). 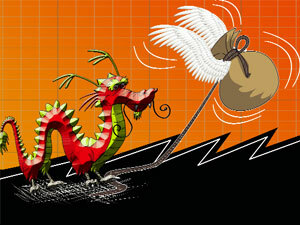 Analysts fear China A- shares joining the MSCI index will worsen the concentration issue. There may not be very high investor interest in the China A-shares as corporate governance is a concern, since many of the 222 companies are large, state-owned enterprises, said an analyst. “You have all of these enormous state-owned banks, the four big policy banks, the oil companies, and these are really not run like traditional Western companies,” said an analyst, who didn’t want to be named. “These companies are filed with inefficiencies, they are filled with conflicts of interest and they are frequently filled with fraud. Adding more of that, even though it’s just a small amount, I don’t think it helps investors,” the analyst said, adding that it was not a problem unique to China but also to markets dominated by such mega companies, like Brazil.